Really though, I'm just popping in today to tell you all I won't be back on the blog until next week. We are taking it really easy with family and my phone has been dead for three days with no chance of me charging it because, honestly, it's been really nice to not have it around catching my attention with a beep or ring here and there. I really should try this more often...we all should try this more often. and soon, Happy New Year! I had this bright idea one afternoon and, literally, five minutes later, we had bunting hanging from the tippity-top of our tree. It’s so easy! No sewing, gluing, measuring, or fuss of any sort. The Grinch would hate it! Wanna know how to make some of your very own? Well, if you don’t, click out because if you know me, you know what’s next. All you’ll need are a pair of scissors, some sort of string (I used twine I had laying around but fishing string or a strong thread would work too), and some wire edge ribbon. I grabbed this wire edge ribbon after Christmas last year on clearance at Michael’s but, even without the clearance price, it’s pretty cheap. If you’re only using it for this project, even the Dollar Store will satisfy the need. First, cut several pieces of ribbon. The number you’ll cut depends on how many far apart you want each piece to sit once it’s on the string. For an eight foot long strand like mine, I cut 13 pieces, each about six inches long (I didn’t measure but just cut the first one and cut the others based on that one). I spaced them about six or so inches apart on my twine. You can space them closer or farther; have more or less. Imperfection is the name of the game and, in this case, anything will look cute! Then, fold each piece in half. 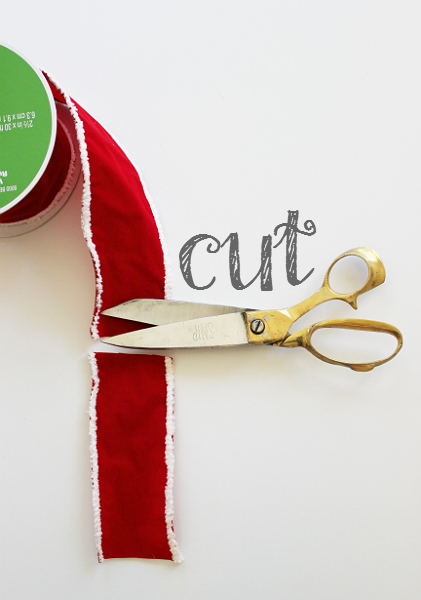 Next, cut a shallow triangle out of the bottom of each folded piece of ribbon. 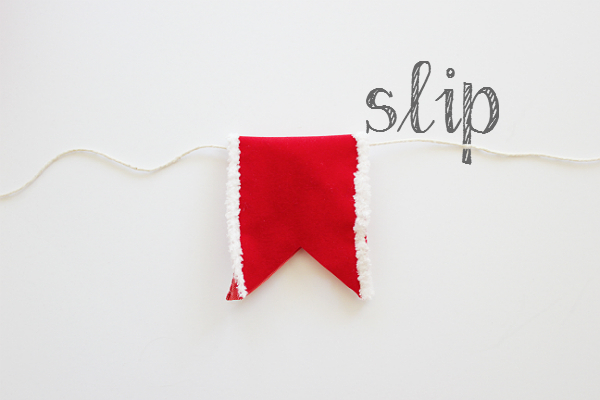 And last, slip each piece right over your hanging string. 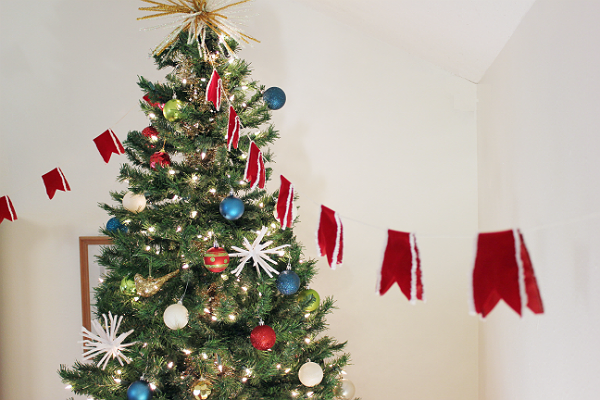 (It’s easier to add the ribbon after you figure out where you want the bunting hung). Giving the wire edges a little pinch along the top of the string will ensure they don’t slide around. So easy, right?! 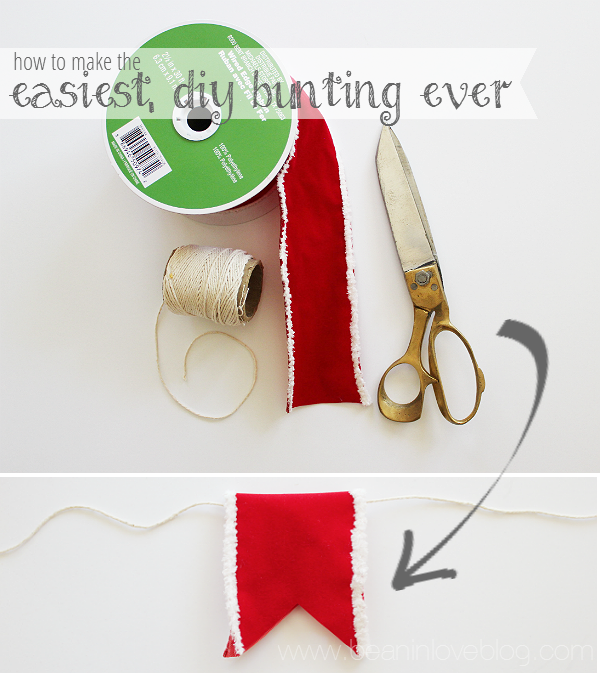 Think of all the holidays and notholidays you can whip up a five-minute strand of bunting! Pastel ribbon for easter, pink and red for Valentine’s Day, patriotic colors for the Fourth, blue and green to match the theme of your kid’s birthday…the options are really endless. 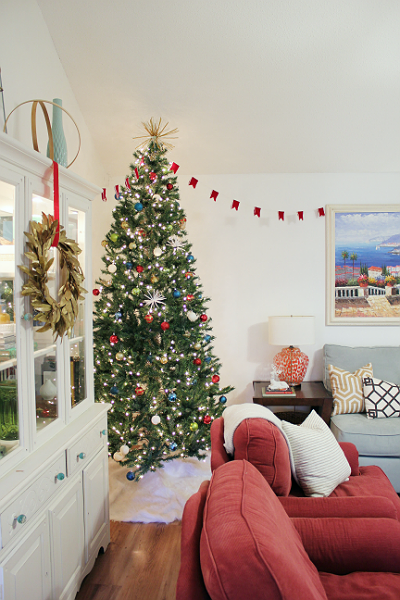 We moved some small pieces of furniture around this year so that we could put our tree in the back corner of our living room and we’re really loving the placement. It’s out of the way but it makes this corner really special (except for the red/cranberry club chairs…I can’t wait to get my hands on reupholstering or doing something with those). 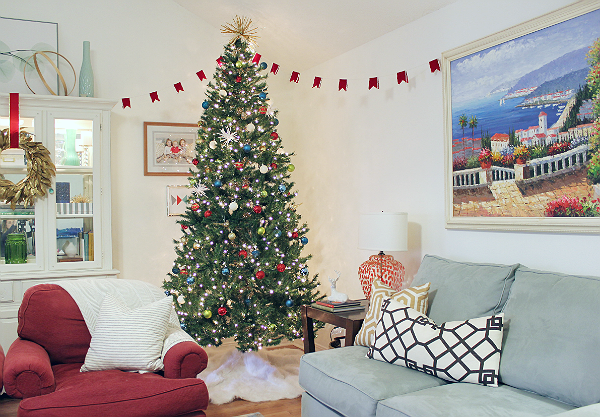 As far as decorating goes, we’re done. I didn’t add more lights to the tree or put on all the ornaments like I usually do because we’ll be traveling to see family for Christmas and so simple did the trick. 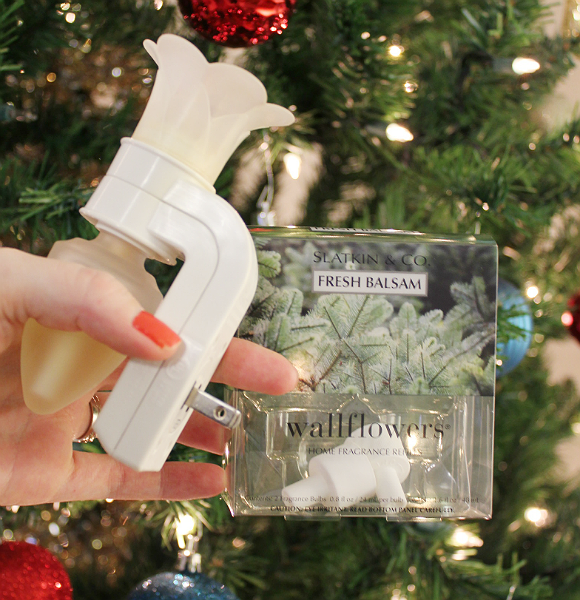 Of course, we also set the sensory mood by plugging in our Wallflower; laden with the scent of Fresh Balsam. I’ve had my wallflower forever but I bought this particular scent five Christmas’ ago and it’s still going strong. We don’t keep it plugged in all the time, maybe a few hours a day, so that helps slow the depletion. 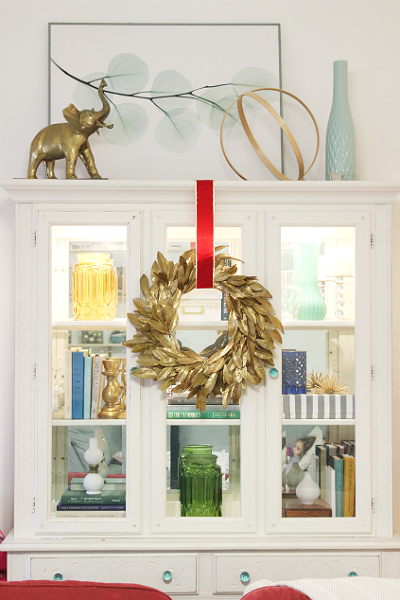 The hutch is decked with a thrifted wreath that I got last year and we recently acquired the brass elephant atop it. You might remember the diy mercury glass vase that once was there…well, somebody (coughAnthonycough) caused it to come tumbling and crashing when he was sliding the hutch around one day so we could clean underneath. It’s really my fault for not having it as secure as I should’ve up there but thankfully, no one or nothing was hurt except the vase and my feelings. Anyway, I’ll be back with the other side of the room before Christmas. Really it’s just the stockings and mantel over thataway but those are a whole tutorial post in themselves. Before I throw a couple of Christmas projects (I know, just in time forrrr…next Christmas) to the blog post mix, I thought I’d sprinkle in a few projects I quickly did in the girls’ room a couple of months ago. You can see the full reveal and stencil tutorial in my last post, if you missed it. Let’s talk about the fan shade first. 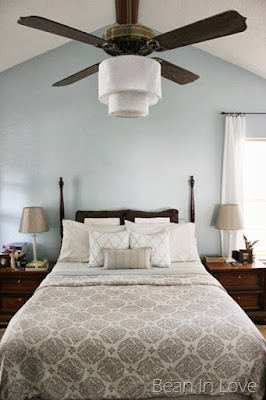 You might remember back when I whipped up an eerily similar one for the fan in our master bedroom a few years ago? Well, you might also remember I kinda hated it. It looked really homemade and I try to sway from that look when I’m creating decor in most cases. So, down it came. Using the same idea and steps, I grabbed the fabric from JoAnn Fabrics (can’t find it online!) and used some of the extra plastic I had on hand from making this shade to create the same thing, only much less wonky. I cried inside but forged ahead in making the light fixture. After the shade was made and recovered, I hot glued the rods back onto the large top ring. Then I glued the ends of the rods to the rod pieces still on the small shade. So far, it’s stayed. 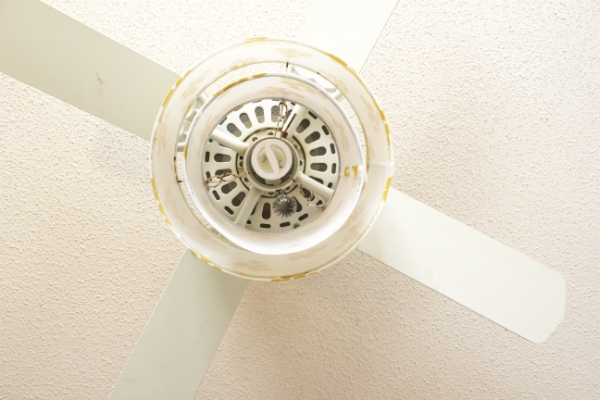 To hang the entire thing, I grabbed some outdoor chain I had laying around and slipped one end over the rods on the small shade and the other ends I slipped through the holes on the actual fan that are reserved for the screws that hold on the original light kit. I should take more pictures to explain that a little better but for hopefully for now it makes sense somewhat. It’s still needs some tweaking because its a little crooked still, but one of these days I’ll figure out a new solution. I love it though. And I love the fabric so much that I made a couple of matching pillow shams out of it to adorn the girls’ beds. They were a trial run so I don’t have a tutorial on those yet but they turned out pretty good so I will definitely let you in on the know-how to those in the future! 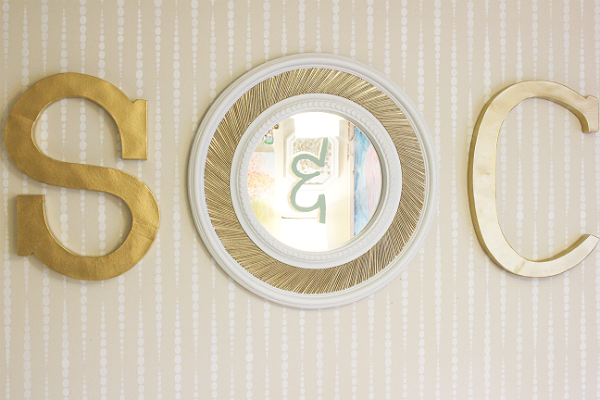 And quick let’s just pop over to the stenciled wall and talk about those big monograms. I’ll be honest. The idea of them looked better in my head. I’m not sure if that wall just needs a little more color or if I need to re-paint a fancier ampersand onto the mirror but something needs something. The letters themselves are these paper mache letters from JoAnn Fabrics. The quality is great and if you can grab them either on sale or with a coupon, you can get them down to almost $5 a piece. The only thing that bothers me a little is that the ‘S’ is a little thicker than the ‘C’ so it almost looks like they’re two different fonts. Maybe that’s what bothering me about this wall…don’t know. They come in a tan color so I just primed and spray painted them my favorite gold (Rust-Oleum's Metallic Gold*). I used velcro Command strips to hang them on the wall just like I hung these paper mache letters in our entry. I finally finished our stockings and hung them on the mantel with care! I’m really excited to show them to you and show you how you can make your very own! Check out Instagram for a sneak peek! Have a great weekend…we’re almost there! I’ve been wanting to up the ante in the girls’ room since they moved in way back when Sebastian took over their old room. During a few weeks in October, I finally got my chance. Shortly after we moved in, we took a can of creamy beige to the walls in here and it worked as a guestroom/office for several years (paint color was Drifting Dune by Valspar). The cream walls were a perfect canvas for adding whatever color of decor I felt like and they still are. Except this summer a friend gave us a beige rug she wasn’t using anymore and I thought the girls’ room would be the perfect new home for it except… …really it just created one big, beige box. I loved the rug too much to part with it so something had to be done. 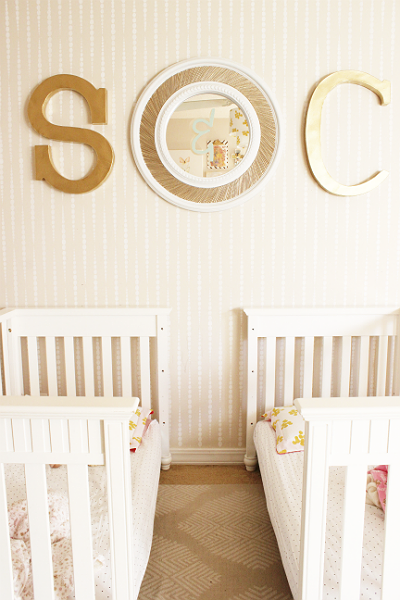 One of those things came in the form of an idea of creating a colorful accent wall behind the cribs. Initially, I had schemed to knock-off this Anthropologie wallpaper by stenciling something similar using some sort of watercolor technique I still had to come up with. But then over time the room started collecting lots of colorful artwork above the girls’ dresser and I thought maybe the colorful wallpaper knock-off idea would just create too much pastel-ish color. Is it possible to have too much color? I don’t know but the thought of walking into a soft-palette, watercolor room read “overstimulation” to me. Plus, the watercolor stencil would’ve probably been a lot of work and it’s not one of those designs that could easily be melded into a new decor plan in the future…the future being when the girls’ turn into real little girls and I want to turn their room into a funky modern yet girly space. So then…I know, “get to the point already!”, I thought maybe I’d just stencil a simple pattern onto the wall that wasn’t in-your-face but wouldn't totally blend into the wall either; accentuating with subtlety. I’ve made my own stencils before but, for what I wanted on this wall, I didn’t have the skill to just whip up a diy stencil much less create something big enough to stencil it. Good thing Cutting Edge does have that skill. When I was set on the subtle stencil idea for this accent wall, I started perusing their site. I had heard of them lots of times via other blogs and I knew they had some really awesome designs. So, together with Chelsea at Checking in with Chelsea, we contacted Cutting Edge to ask if they’d sponsor a post and they said “YES”! Honestly, I was planning on grabbing a stencil during their next sale anyway but I thought maybe we could try to collaborate with them first and so I was floored (walled?) and excited when they sent us each a Beads Allover stencil plus a Stencil Essentials kit. But anyway, enough with the small talk. Let’s talk about how this went up. First, I moved everything away from the accent wall, took down the mirror, and gave the wall a quick wash with some mild soap and water. I started the stenciling process by stenciling along the ceiling first. Cutting Edge includes a top edge stencil with their allover wall stencils to make stenciling along the ceiling a breeze. I found that using the end of the foam roller that came in the Stencil Essentials kit to stipple the paint onto the stencil worked the best for me. The walls in the girls’ room have a fair amount of orange-peel texture to them but the foam cut the bleeding because of the texture to a minimum and allowed me to get super close to the ceiling. I did have to wipe off the back of the stencil after every couple of rounds but having a pack of wet wipes close made it easy to do. This might not have been as necessary with non-textured walls but since mine are, paint did tend to seep behind the stencil a tad. Spraying the back of the stencil with spray adhesive would probably have cut down on the bleed too but I didn’t want to spray that stuff in the girls’ room and the thought of running to and fro outside and their room wasn’t appealing time-wise. That black strip attached to the stencil is a clip-on stencil level. This little thing was awesome and I highly recommend grabbing one for your next stenciling project! It’s a miniature level that attaches to the top or bottom of the stencil. 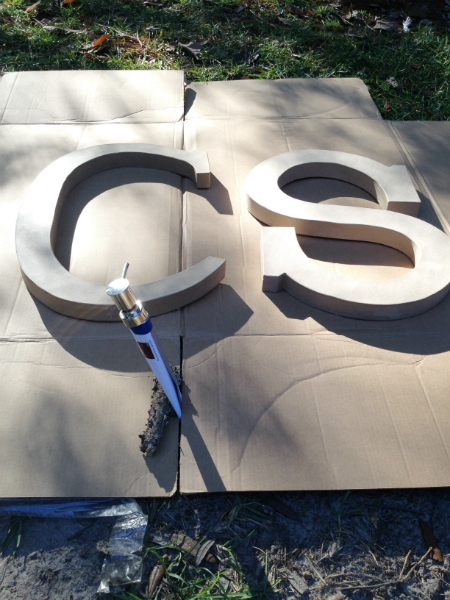 It cut out all the measuring to make sure the stencil was painted on straight. One quick glance at the level is all you need get things nice and straight so that you can spend more time focusing on important things like painting and watching how much paint you’re getting on your roller. I don’t know if borders are out these days but I thought the Beads stencil looked cute just along the top of the wall. Next up was…the rest of the wall. I didn’t realize how large this stencil actually was before I took it out of the packaging. It’s big. Great too because a big stencil meant less work for me. At first I just taped the sides of the stencil to the wall after making sure it was level using some painters’ tape I had on hand. The problem was that the painters’ tape I had wasn’t really holding the stencil up. It was painters’ tape I’ve had forever and was probably cheap. Doh! I didn’t have time to go out and grab more tape since I had a limited time schedule (bedtime for a couple of nights only) so I remedied the sad sticking situation with sticky tack! I just stuck a little ball of it to the four corners of the stencil and it worked like a charm! The stencil was going nowhere but onto the wall! I think I’ll go for the tack over tape for any future stencil too. It’s easy to remove and just stick to the next area; no grabbing another strip of tape or worrying about where the heck you laid the tape you need rightthisminute. To paint the stencil, I used the foam roller on it’s handle. Since my walls are textured, barely covering the roller with paint was KEY! Using the paint tray below (Home Depot, I think?) made it easy for me to load up the foam roller with paint and then roll the excess off onto the platform. After I was done stenciling the entire middle of the wall, it was time for the corners. Like I said above, I was a little nervous about these because I wasn’t sure if bending the stencil into the corners was going to permanently bend the stencil or if all would be unscathed. I was pleasantly surprised and super impressed with how the stencil handled corners though! It came out looking as great as when it came out of its packaging! Sticky tack worked so much better than tape for me and was a lot more efficient, especially since I was on a major time crunch to get the girls’ room back to normal. If you are stenciling textured walls, wipe off the back of the stencil every few rounds. Don’t be afraid to give a little stencil-love to textured walls! It can be done! Stippling with the end of the roller was a great way to get really close to the ceiling vs. rolling the paint on along the narrow edge stencil. The paint tray I used with the small platform on it was great at helping get the right amount of paint onto the roller (this one* is similar to mine but I’m sure you’d probably be able to find one at a home improvement store too). I used a white Glidden paint in satin to paint on this stencil. It dried fairly quickly which is key in stenciling. The faster the paint dries, the less chance it has to bleed or get smudged. Cutting Edge has a great list of FAQ’s on the actual stenciling process that you should definitely check out when buying a stencil. Overall, I really don’t have anything bad to say about the whole experience. I’m 100% sold on stencils (again) as a much, much, much cheaper wallpaper alternative and to liven up any room. 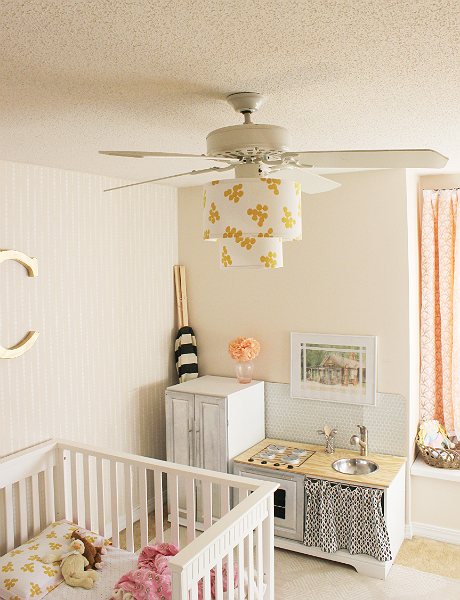 I’ll have lots more details about all of the other projects I finished in this room in the coming weeks but for now, let’s take a little tour of the girls’ sweet space, shall we? But then we made big progress into turning it into a guestroom guests would feel much more cozy in. And in case you’re wondering how in the heck I keep their room so clean, I don’t. I just lock them out when I need to take blog pictures when the bright sun is shining in during the late-afternoon…and I call on a certain Explorer to babysit. Once that lock is unlocked though and the cubs are let in, it’s all scatter and dump. Make sure you check in with Chelsea to see what she did with the Beads stencil! And PS, thank you for all the love after our bitty baby announcement Friday! I’m so blessed to have such friends in my readers! XO! We’ve always wanted a “big” family…big as in more than one or two kids. We saw built-in best friends, family game nights, and fun family vacations that started with road trips of a filled vehicle. Not to say that small families don’t have any of that, because they can, but we just envisioned a full house if you will. I distinctly hearing one of my favorite priests in college saying, during a homily about married couples and the vocation of marriage that we should “populate the Earth with good people”. To me, that meant having 23 kids…totally kidding, but it did give me the desire for a large family of 4 or more kids. I wanted to help fill their Earth with good people. 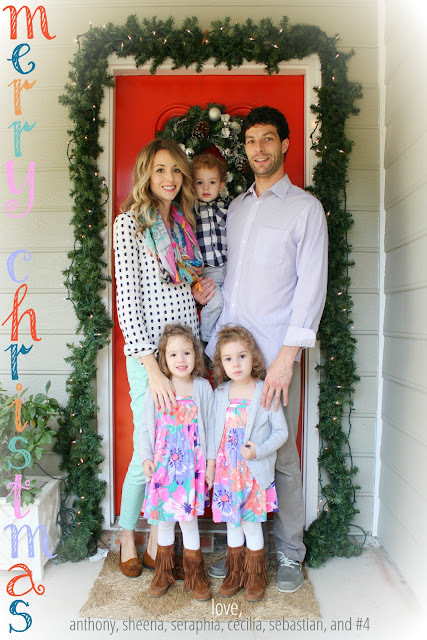 Of course there are lots of factors going into how many kids made up our big family ideal – things like budget and fertility, both of which are or at one time were pretty sparse. We’ve also always wanted our kids to be close in age. The twins and Sebastian are closer in age than we thought we wanted but it’s turned out pretty awesome. So, since Sebastian is going to be two in a month, it’s been time to start thinking about the next little bean. We have actually been discussing him or her for the past several months, thinking that if he or she could come along anytime after Sebastian hit two, that’d be just peachy. Only we just weren’t sure how that little bean was going to get here. For one, we weren’t sure if we were going to struggle to have more kids since we struggled with fertility for years before the twins came along. Sebastian arrived without an infertility beat so maybe that wasn’t a struggle anymore, maybe it was. We’ve been avoiding the marital deed during ovulation each month (we’re on the Natural Family Planning train…tmi for some of you…sorry!) so we didn’t know what would happen if we tried during that time or what. But bigger than that, it’s been on our hearts to adopt. There are lots of reasons why but one thing that has convicted me in that possibility is everything that has been going on with Planned Parenthood. (If you live under a rock, they’ve been selling the body parts of the babies they’re killing…illegal and plain disgusting.) I’m not going to step on a soap box about that but it’s made me realize for the 1000th time how much of a tragedy it is that we are allowing the murder of innocent babies in this country. I ache for the babies and I ache for the mothers that are going through so much junk that killing the child growing inside their womb becomes a condolence and is “making it all better”. I want to hold those moms and tell them it’s going to be okay. There are so many families who are aching to adopt and I wish these women knew that; knew there was a better way. Along with all the aborted babies and sad mothers there are so many children in the U.S. living lives that are filled with trauma, abuse, loneliness, abandonment, and zero security who are in foster care and/or waiting to find a forever home filled with the love they’ve never been shown. It’s all just overwhelmingly sad to me and to us. I want to take them all in but of course that’s an unrealistic desire. But, taking in one or two isn’t. So, this past summer, we made the decision that we were definitely going to hop on the adoption track and that we were going to start looking into and starting the process. God’s really funny, isn’t He? We are elated and so excited and laughing right along with Him. And we’re still in shock too but mostly so, so happy. Baby Tobin will be here in June of next year and we’ll have four under four for a month which is really scary and really fun all rolled into one little ball of beautiful. I’ve been meaning to tell you all for over a month now but I had my heart set on a cute little announcement including Anthony and the kids, all with their respective numbers 1, 2, 3, and then new baby 4 but it was looking like we’d get that picture taken the day before the baby was born next summer so it’s just me and #4, taken with a self-timer during nap time. Haha! So does this mean adoption is out? Nope! Obviously we’ve had to set it aside for awhile but we still very much want to pursue it in the future. We’re a little sad (but still very happy we’re expecting…don’t get me wrong) but God has shown us plain as day what His will for us is right now and we’re are just going to roll with it. Anyway, please keep us and this little bean in your prayers! You can be sure that I’m offering up some of these wonderful pregnancy symptoms for you! Oh and if you’ve been wondering why I’ve been boring on the blog recently, well, now you know. First trimester slothfulness. It’s all over me……. Gorgeous print in the frame above is from Hatch Prints! I’ve always been a big fan of Cyber Monday but always as a buyer, never as a seller…until this year! To take part in the coupon madness, here are a few codes you can use over at Bean In Love Studio! Sorry for my absence on the blog for the past couple of weeks! We got back at 4am this morning, finishing off the 16-hour (more like 18 with kids) drive from my home state of Nebraska. We had a great Thanksgiving week with family but now we’re back and scrambling to get ready for Jesus to come! It seems like it’s never ending but the only time that’s really welcomed is during Christmas, right? I’ll be back later this week with some fun stuff I’ve been working on! Happy Monday! I feel like a new woman! My head is slowly coming out of the fog that has been the last five days. A couple of hours after this recent ‘gram, things around here went south…or should I say north. Sebastian ejected the entire contents of his day out of his mouth on our way home from the playground (oh yes, think carseat…everywhere) and it didn’t stop there. Oh no. The next day and a half after that hold the record for the most vomit I’ve ever seen come out of any of my kids mouths…the record because, until now, we have somehow escaped it. We’d never had to deal with a stomach bug plus a heaping side of vomit before the last few days. It’s awful to see your kids suffer and not be able to take it all away. After the vomit came the flood out the other end for all kids and I’ll just stop there because I’m experiencing some feelings of PTSD arise and I’m sure you want to know allll the details. Right. Anyway, I’m just so happy to be here today and I’m overjoyed our kiddos are smiling again. I wish the screen could exude my excitement a little more. We had a normal night last night and a normal morning this morning so I’m calling all systems go. I might even get dressed today knowing that the chances of my clothes wearing bodily fluid are super low. It’s great and I’m just happy to be alive with all kids in tow! I even got the kids dressed. But let’s zoom in on the fur, shall we? That’s why I’m really here today anyway. Those vests were my miniscule link to reality the past several days. I made them in two fifteen minute breaks while all sick kids were sleeping (two breaks because poor cries cut me short during the one shot I had to get them all done). They only cost me about $3 each too! 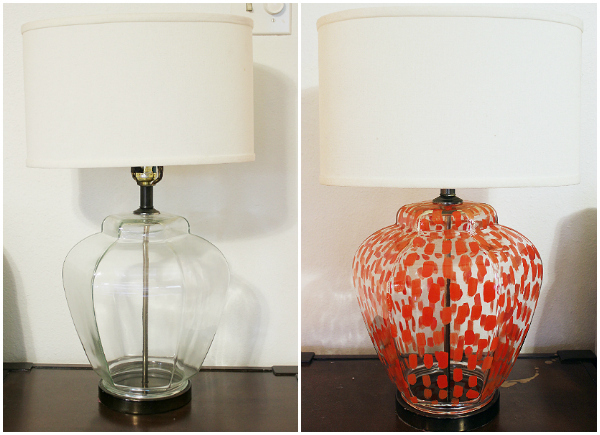 So, like I do, I’m going to tell you all about how I made them and how you can make them too! Oh, and did I mention that you can make them without sewing a single stitch? You can! I know I said you can make these without sewing; that’s where the staples come in. But if you know how to sew a simple straight stitch or you’re a beginner hand-sewer, you can use a machine or needle and thread instead of the staples. Since I know how to sew, I used my machine. First, you’ll want to grab this free toddler vest pattern from Once Upon a Sewing Machine. You’ll only need the front and back pages, not the hood. Print it out and cut it out along the given lines. On the pattern it says to add 6.5 inches to the bottom of each piece but I only added three because the vests would’ve been way too long with 6.5 more inches on my girls. To add those inches, I just taped a piece of paper onto the bottom of each piece and cut it so that the sides lined up all the way down and so that it extended that three inches from the bottom of the pattern. I also cut off the small part on the front pattern piece placed there for buttons (that middle strip that’s cut off in the picture above). I wasn’t going to have any buttons so I didn’t need the extra fabric there. The next thing I did was make the arm holes a little smaller. To do this, I pulled out one of the girls jean vests and moved it so that it was laying on top of the pattern armhole with the top of the shoulder and sides of the vest lined up with the top and sides of the pattern. Then I just traced it onto a sheet of paper I had taped under the pattern armhole and cut it out. This is before I positioned the jean vest where it needed to be lined up to trace it, but you can see how much smaller the actual vest armhole was. It’s worth noting though that my girls are fitting comfortably in 2T tops right now so if you’re making this for a child closer to 4T, you might be able to keep the armholes the size they are. It’d be worth comparing it to a sleeveless shirt or vest you already have to make sure though. At this point I thought I was ready to take the fabric to the fur but when I placed the front and back pieces together (they meet at the armhole side), one was longer than the other. I wish I could’ve said it was my measuring error but as it turns out, the front of the pattern is actually a smidge longer than the back. It was an easy fix though; I just sliced that extra length off the bottom and to the fur I went. So, you’ve got your fur. Lay it fur-side down on a table but make sure that you lay it so that the fur is pointing in a downward direction – the nap of the fur goes down towards the bottom of what will be your vest. Does that make sense? I folded the end of the fabric over in the picture above so you could see how my fur was laying. Next, flip your pattern over and line it up along that middle line you drew. Make sure you literally flip the pattern over! Don’t just slide it over! Trace a half-inch out again along all sides. You won’t need to trace along the now-right side again. This is what the back of the fur will look like when you’re done. Now it’s time to cut along every line but that middle line. Cutting fur is a little tricky. 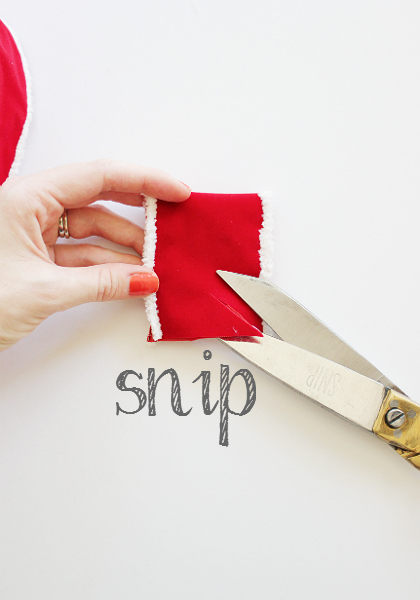 If you can, use a small, pointed scissors and snip away in small increments from the back of the fur. 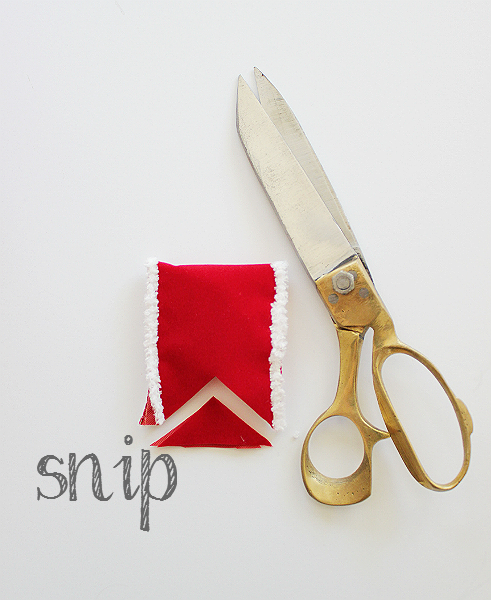 If you don’t have a smaller scissors, a regular-sized pair will work too but just remember those small increment cuts. They’re crucial in not cutting off the fur so it looks like it got chopped at the $5 hair salon. In cutting in small increments, you’re not really cutting fur as much as you’re just cutting the backing. Once you have your vest cut out, it’ll be time to attach the shoulders. I sewed them together but you can staple them if you don’t know how to sew! I promise it’ll hold up and no one will know but you! First though, we need to trim away some fur so that the seam isn’t so thick – it wouldn’t fit under my machine foot the way it was. To do that, just trim off the fur along the top half-inch or so. Then, fold the sides of your vest in, fur-side in, so that the front and back shoulders line up. If you’re sewing, sew a straight stitch like this but stop a half-inch from each edge. You’ll glue those unfinished ends down in a minute. If you’re stapling instead of sewing, just placed a line of three or four staples horizontally along the line I sewed. 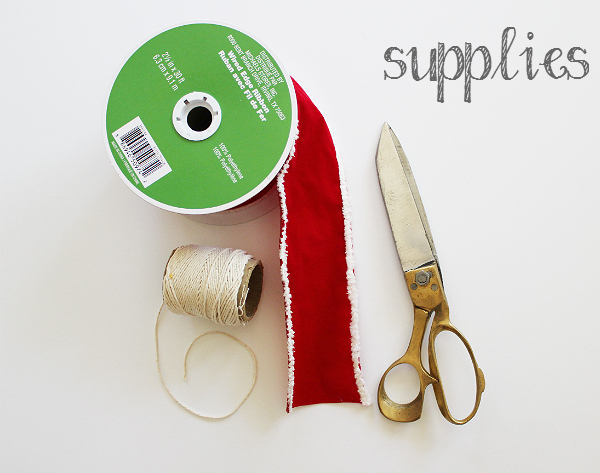 Or if you know how to hand sew, you can sew a quick line too! Once you’re done attaching the shoulders, you can move on to the hot gluing or you can quickly cut a v-neck in the front of the vest like I did. Starting at the top inside shoulder, I just drew a straight line a little more than half way down the front inside hem. Then I used the same small-increment snipping to cut that little triangle off each side. Last step! Hot glue! This part was hard to document because hot glue dries so quickly but basically I went around each edge of the vest minus the very bottom hem and glued a half-inch hem. I worked in three or four-inch sections so that the glue wouldn’t dry faster than I could get it on. I didn’t do the bottom hem because the fur hangs down far enough to cover the backing completely. You can see in the picture below that the bottom part of this side is glued. The white line shows where I placed the glue. Once the glue was there I just folded the edge of the fur over onto itself, pressed it and held it until the glue was dry, and wala! 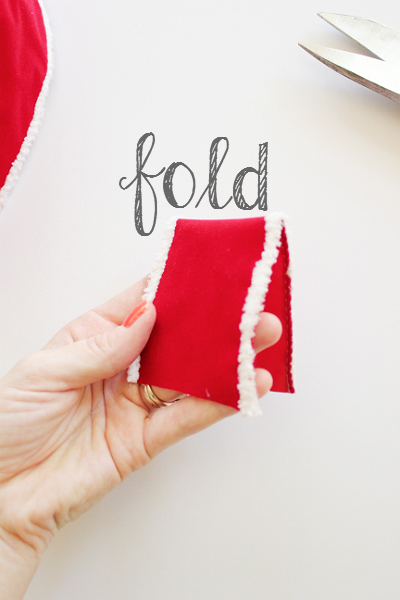 An easy hem! I even folded the arm holes in a half inch and did those. I feel like hemming all the edges makes everything look a little cleaner because you can’t see any backing peeking out from anywhere. Taking the after pictures was actually the hardest part for me. So many acorns. So little time. Here’s the funny thing about this project - I bought this fur last fall thinking I’d make the vests back then and they just got shoved to the end of the project line and now, here they are. Haha! But, as it turns out, they would’ve look huge on the girls last year. The timing will now allow them to be worn this year, next year, and maybe even the next year after that. Unintentional providence that is also known as procrastination ftw. Adios. I have lots more procrastinating to attend to…the dishes for example. The couch is calling my name.